Julie grew up in Montreal where she completed her B.Sc. in Earth System Science at McGill University. She has experience using satellite remote sensing and repeat photography to study land cover change. Her undergraduate honours thesis involved creating an algorithm to update time series of classified satellite imagery using Bayesian statistics. From there, she went on to do a Master's at the University of Victoria studying land cover change in the Alberta Rocky Mountains using collections of historical photographs from the early 1900s. 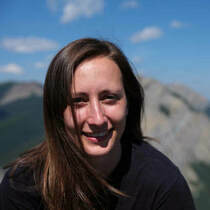 She has been working at the LUGE lab since 2019, assisting in data science tasks relating to global agricultural datasets. Fortin, J.A., Fisher, J.T., Rhemtulla, J.M. and Higgs, E.S., 2018. Estimates of landscape composition from terrestrial oblique photographs suggest homogenization of Rocky Mountain landscapes over the last century. Remote Sensing in Ecology and Conservation. Cardille, J.A. and Fortin, J.A., 2016. Bayesian updating of land-cover estimates in a data-rich environment. Remote Sensing of Environment, 186, pp.234-249.